What started as imaginative musings turned into a full length novel. 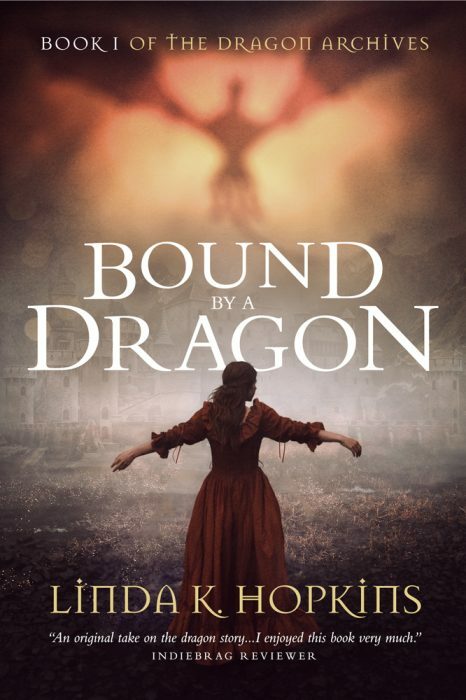 A love strong enough to overcome any difficulty, a heroine who is courageous in the face of danger, and a dragon! A medieval tale replete with medieval characters. After all, what could be more medieval than a women being told whom she should marry and a dragon that lives in the mountains? The dragon stared at Keira in silence for a few moments, then bent its neck into a graceful arch and brought its face close to hers. Keira quelled the desire to step back, instead keeping her feet firmly planted as she continued to gaze at the dragon. "Why did you take me?" she finally asked, shuddering at the thought of what might have been. She lifted her hand to her face, feeling the sting of scratches scored down her cheek. A flash of sharp teeth made her draw in her breath as the dragon replied with a growl. "I’m sorry Keira," it said. "I should have been there sooner. When I think of what that boy was about to do …" The dragon stopped and pulled in a breath. "I shouldn’t have left him alive." Keira trembled at the thought. "But why?" she said. "What does it matter to you?" The dragon stared at her for a long moment, until finally it breathed out a sigh, sending sparks flaring from its nostrils. "Come closer, Keira," it said. Keira hesitated, wondering what the dragon intended to do with her. "I won’t hurt you," it said. Keira looked at the mighty beast before her and suppressed a shudder. Its claws rested on the ground, razor-sharp and menacing. She could see its pointed teeth and knew that it could rip her to shreds in an instant, or burn her to a crisp with one hot breath. One swipe of its massive tail could send her flying through the air, or leave her broken on the ground. Keira knew that the dragon could wield mighty power with barely any effort, striking fear into the hearts of many brave men. But as she looked at the dragon, gazing into eyes that blazed like the fire it breathed, she knew she was in no danger. "I know," she replied softly. "I believe you, even though you terrify me." "Why?” asked the dragon in surprise. "You know that I could kill you as easily as you would swat at a mosquito. Maybe I only saved you so that I could have you for breakfast! Maidens taste especially sweet first thing in the morning." Keira grimaced before slowly replying. "You said you wouldn’t hurt me, and I trust you. I’ve heard plenty of stories about dragons, but you make me feel …" She searched for the right word. "Safe."